The idea that led to the invention of the computer, an idea that Alan Turing put forward in his 1936 paper ‘Computable Numbers’, did not start with a mathematical puzzle. It started with a love story, and a gay love story at that. 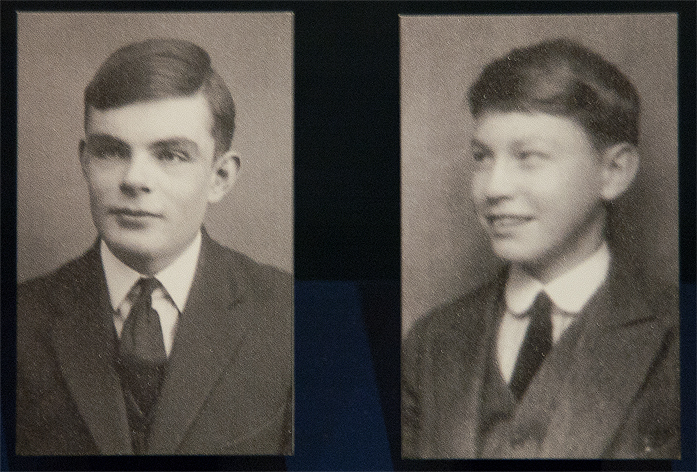 Alan Turing became friends with Christopher Morcom in1928. Morcom was, in many ways, Turing’s first real peer. He was, like Turing, a mathematician and a scientist. “When they were together,” David Leavitt writes, “the boys were more likely to talk about relativity and the value of π – which Turing, in his spare time, had calculated to thirty-six decimal points – than about poetry. Despite their seemingly dry subject matter, these conversations hummed, at least for Turing, with poetic intensity.” It was an unrequited love, by all accounts, but it was no less significant for that. In the early hours of February 7, 1930, Turing had a premonition of Morcom’s death. The abbey clock struck a quarter to three, and he looked out of the window and saw the setting moon, which he suddenly knew was a “goodbye to Morcom”. That same night Christopher Morcom was taken ill with tuberculosis, and on February 13 he died. Turing was devastated. Yet on 16 Feb he wrote to his mother, “I feel sure that I shall meet Morcom again somewhere and that there will be some work for us to do together.” Turing’s writing about Morcom in the years following his death betrays all the hallmarks of adolescent love. “It never seems to have occurred to me to make other friends besides Morcom, he made everyone else seem so ordinary,” he wrote in a letter to Morcom’s mother. The loss fixed Morcom, and the very idea of love, in a romantic ideal; as Leavitt notes, there was no chance for this love to sour, and for reality to set in. “Perhaps as a result, he spent much of the rest of his short life seeking to replicate this great and unfulfilled love.” What is certain is that the death of his friend had a decisive effect on Turing’s creative mind, and he developed a mystical attitude toward Morcom, as well as toward death and the idea of the spirit. In an essay titled ‘Nature of Spirit’, written in 1932 and sent to Christopher Morcom’s mother, Alan Turing started to explore the mystical ideas that had been working their way around his head in the years following Morcom’s death. “It used to be supposed in Science,” he began, “that if everything was known about the universe at any particular moment then we can predict what it will be all through the future.” The theory of relativity, and the unpredictability of atoms and electrons, had changed that. Yet what power does the will, the spirit, have over that unpredictability, he then asked, and what is the role of the body in this? “Personally I think that spirit is really eternally connected with matter but certainly not always by the same kind of body,” he concluded. “The body provides something for the spirit to look after and use.” The spirit, and the vessel that held the spirit, were to Turing’s mind separate and separable. This thinking had a profound impact on how he conceived the idea of the “universal machine”. In ‘Computable Numbers’, the idea of a universal machine that Turing put forward separated the machine itself, i.e. the body, from the software that allowed the machine to function, i.e. the mind. It was from this revolutionary idea that the modern digital computer was born. His thinking about the nature of spirit in the wake of Morcom’s death, moreover, linked back to what he had been taught by the influential book Natural Wonders Every Child Should Know, by Edwin Tenney Brewster, which had been given to him when he was 10. After the loss for Morcom, Turing started to puzzle out the nature of mind and spirit, and its relationship with the physical machine, the body. It was this creative leap that drove his career. Questions of free will and determinism, and the extent to which the mind controls the body, are at the core of ‘Computable Numbers’. The most complex and difficult ideas of Alan Turing, from the universal machine to artificial intelligence, which he explored when he asked “can machines think?” in his 1950 paper ‘Computing Machinery and Intelligence’, link back to this love story and its consequences. Alan Turing believed that the spirit could live on, and he proved that yes, it could. In the end, Morcom’s spirit lived on not in his body but in a wholly different form, in the work of Alan Turing.